Our grand Colorado road trip began with a day hike up in Rocky. We dropped the nieces off at daycare and took off for Estes Park, getting one of the last parking spots just below the Glacier Gorge trailhead lot. 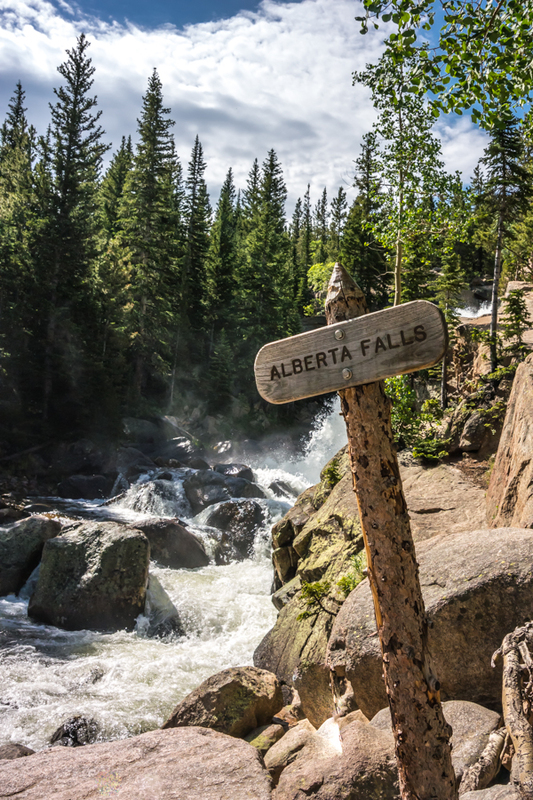 Early summer hiking in Rocky can be tricky and we didn't make it to our final destination past Timberline Falls. The slopes were too icy for us to traverse without poles or spikes. But a picnic lunch at The Loch and the rest of the views were spectacular. A hike out to Alberta Falls and the Loch is moderately easy. You definitely gain elevation but the grades of the trail are forgiving and if you go at your own pace, this trail is manageable for hikers of a wide range of fitness levels. Alberta Falls is only about a mile in to the trail so an out and back there is friendly for hikers of all ages (or those carrying them on their backs). After we turned back just under Timberline Falls, we considered adding a visit out to Mills Lake and back. With the nieces in daycare, we weren't confident in being able to get done in time. Next time! Pro Tip: Be more prepared than we were for lingering snow in the Rockies! Pack your spikes or your poles. Make sure you have enough time planned for your hike to be slowed down by slippery terrain.